BUENA PARK -- Twenty riders and one ride operator were rescued from a ride at the southern California amusement park, Knott’s Berry Farm on Friday night, with some being trapped for more than seven hours. The riders, both children and adults, were harnessed to firefighters and hugging them tightly as they were lowered one-by-one from the Sky Cabin. One girl who appeared to be about 10 years old could be seen smiling as she descended, her turquoise Converse sneakers dangling high above the crowd of onlookers. Firefighters briefly pulled a large, cherry-picker crane up to the ride but decided not to use it and returned to using the ropes. After about two hours, around half of the riders, mostly children, were down. Initial reports said 18 people were trapped, but Knott’s Berry Farm issued a statement saying 20 riders and one ride operator had been rescued by 10:00 p.m. PT. At about 2 p.m. the Sky Cabin ride stopped approximately 100 feet in the air, Knott’s Berry Farm said an email, CBS Los Angeles reports. Maintenance crews made several unsuccessful attempts to bring the ride down before contacting the Orange County Fire Authority (OCFA). “What we’re gonna do right now is formulate a plan on exactly how to bring them down,” Capt. Larry Kurtz told CBS Los Angeles. By 6:30 p.m., the rescuers had climbed to the top of the ride, about 225 feet up, and rappelled down to the trapped passengers in the cabin. 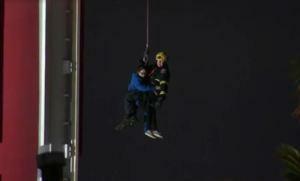 At around 7:15 p.m., the OCFA began rappelling people to safety using a line and a harness. Women and children were being rescued first. As of 9 p.m., 11 people had been rescued. One little girl clung to a firefighter as a rope lowered her to the ground. Eddie Kim told CBS Los Angeles that three of his children were on the ride when it stalled. “My two daughters came down… my eight-year-old girl was crying when she came down,” Kim said. It was 100 feet high when it stopped at about 2 p.m., Knott’s said in a statement. Park mechanics made several attempts to bring it down before calling the fire department. The OCFA tried to bring in a cherry picker lift that would have allowed for multiple people to be rescued at once. However, that attempt failed and firefighters were forced to resort to rappelling one person at a time. It was not immediately clear what may have caused the ride to stall.